A short biography of the anarchist-influenced writer whose name spawned an adjective for the absurdities of bureaucratic power. Franz Kafka was born Prague in 1883 the son of a wealthy Jewish-Czech family. His father was described as a "huge, selfish, overbearing businessman." The eldest of six children, his two brothers died before the age of six, while his sisters outlived him only to die in the Nazi concentration camps. 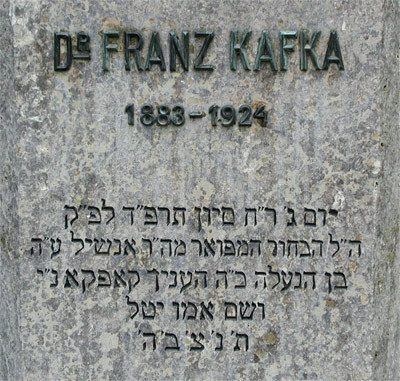 Bilingual in German and Czech, Kafka studied Law at the University of Prague, graduating with a degree of Doctor of Law in 1906. He subsequently performed a year’s mandatory unpaid service as law clerk for the civil and criminal courts, but then took a job in insurance, which he referred to as a "brotberuf", literally "bread job", a job done only to pay the bills. These dual experiences of alienating, meaningless work and the vagaries of legal, bureaucratic power were to become core themes in his writings. Kafka was an insecure man, believed to have suffered from clinical depression and social anxiety throughout his life, and subsequently little of his work was published during his lifetime. The posthumous notoriety he now enjoys owes much to his closest friend Max Brod, who disregarded his instructions to destroy his unpublished manuscripts upon his death. According to associates, Kafka was interested in the contemporary anarchist movement and had attended meetings of the ‘Klub mladijich’, an anarchist group that was under police surveillance. However, he was was reportedly known as the "colossus of silence" on account of his tendency to sit and listen rather than contribute. Consequently he was not mentioned in police records or by members under interrogation, and he himself had no criminal record. Whilst this may suggest Kafka was only on the periphery of the movement, he did reportedly attend a demonstration against the execution of Spanish anarchist teacher Francisco Ferrer in 1909, and in the course of 1910-1912 is reported to have attended anarchist conferences on free love, the Paris Commune, peace and in opposition to the execution of the Paris activist Liabeuf, which were organized by the Klub mladijich, the anti-militarist and anti-clerical Vilem Koerber Association, and the Czech Anarchist Movement. In the end he succumbed to the tuberculosis that had dogged him for years, and died of complications in Prague in 1924 aged 40. However, he left behind a body of works much informed by anarchist ideas, containing unique explorations of our existential condition when confronted by mundane work, the pettiness of landlords and the arbitrariness of state power.